We’re constantly being peppered by showers of debris from cosmic rays colliding with atoms in the atmosphere. Cosmic rays aren’t actually rays, of course, they’re particles; ninety percent are protons, the nuclei of hydrogen atoms, and most of the rest are heavier nuclei like iron. Some originate from our own sun but most come from farther off, from the Milky Way or beyond. “The most energetic cosmic rays are the rarest, and they pose the biggest mystery,” says Spencer Klein of Berkeley Lab’s Nuclear Science Division. He compares the energy of an ultra-high-energy (UHE) cosmic ray to a well-hit tennis ball or a boxer’s punch – all packed into a single atomic nucleus. Being electrically charged, even the most energetic cosmic rays are forced to bend when they traverse interstellar magnetic fields, so it’s not possible to extrapolate where they came from by looking back along their paths when they arrive on Earth. In all that volume of “nearby” space, sources capable of producing such high-energy nuclei have not been clearly identified. One clue to the origin of the highest-energy cosmic rays is the neutrinos they produce when they interact with the very cosmic microwave photons that slow them down. The flip side is that it’s quite a trick to catch neutrinos, especially those produced by rare events. Locating neutrinos produced by UHE cosmic rays needs a detector covering a huge area. Which is how Klein came to find himself tent-camping on the Ross Ice Shelf last December (the middle of summer in Antarctica), along with his colleague Thorsten Stezelberger of the Lab’s Engineering Division and camp manager Martha Story from the Berg Field Center, a support service at McMurdo Station, the main U.S. base in Antarctica. Klein and Stezelberger were setting up a prototype station for the proposed ARIANNA array of neutrino detectors (ARIANNA stands for the Antarctic Ross Ice Shelf Antenna Neutrino Array). Unlike such neutrino detectors as SNO in Canada, Daya Bay in China, Super-Kamiokande in Japan, or IceCube, the huge neutrino telescope under construction deep in the ice at the South Pole, ARIANNA doesn’t need miles of rock or the Earth itself to filter out background events. That’s because ARIANNA will be looking for an unusual kind of neutrino signal known as the Askaryan effect. ARIANNA will observe the shower of electrons, positrons, and other particles produced when a neutrino interacts in the ice below the ARIANNA detectors. In 1962, Gurgen Askaryan, an Armenian physicist, pointed out that these showers contain more electrons than positrons, so have a net electric charge. When a shower develops in ice, this moving charge is an electrical current which produces a powerful pulse of radio waves, emitted in a cone around the neutrino direction. The energy shed by particles moving faster than the speed of light in a medium like glass or water (light moves through water at only three-quarters of its speed in vacuum) is called Cherenkov radiation, and is perhaps most familiar as the blue glow made by fast-moving electrons in a pool surrounding a nuclear reactor. The same visible-light-wavelength Cherenkov radiation is used to detect charged-particle events created by neutrinos in detectors like IceCube. Instead of optical wavelengths, ARIANNA observes Cherenkov radiation at radio wavelengths; the strength of the radio signal is proportional to the square of the energy of the neutrino that gave rise to it. To capture these signals, ARIANNA will use radio antennas buried in the snow on top of the ice. The Ross Ice Shelf makes an ideal component of the ARIANNA detector – not least because the interface where the ice, hundreds of meters thick, meets the liquid water below is an excellent mirror for reflecting radio waves. Signals from neutrino events overhead can be detected by looking for radio waves that have been reflected from this mirror. For neutrinos arriving horizontally, some of the radio waves will be directly detected, and some will be detected after being reflected. 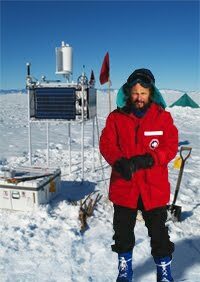 As envisaged by its principal investigator, Steven Barwick of UC Irvine – who visited the Ross Ice Shelf in 2008 – ARIANNA would eventually be comprised of up to 10,000 stations covering a square expanse of ice 30 kilometers on a side. Ten thousand stations is the eventual goal, but the first step is to see whether just one station can work. During the Antarctic summer, solar panels will provide power for the radio antennas under the snow and the internet tower that sends data back to McMurdo Station, via a repeater tower on nearby Mt. Discovery. During the long, dark winter, it’s hoped that the power will come from wind turbines or a generator. On the second day the team unpacked and assembled the six-foot tall station tower, made of metal pipes anchored to plywood feet under the snow. The tower holds four solar panels, a wind turbine, and antennas for receiving time signals from global positioning satellites, and for communicating via Iridium communications satellites. After another week, which was mostly spent testing instruments, including bouncing radio signals off the water-ice interface, plus two days waiting for the weather to clear so that helicopters could pick them up, the team finally struck camp. After packaging their gear in slings to be picked up by subsequent flights, they climbed aboard a chopper and returned to base, leaving behind a functioning station intended to survive the oncoming winter. Klein and Stezelberger made it back to Berkeley Lab by the last day of December. Klein, aided by UC Irvine’s Barwick and graduate student Jordan Hanson, neutrino physicist Ryan Nichol of University College London, and Lisa Gerhardt of Berkeley Lab’s Nuclear Science Division (herself recently returned from work on IceCube at the South Pole), spent the next weeks analyzing the data from the ARIANNA prototype station on the ice, as it continued to report via the internet. The stream of information included housekeeping data and scientific data in the form of antenna signals. The antenna data was also instructive, and there was a lot of it – signals from natural background noise and from man-made sources. An event every 60 seconds was the “heartbeat” pulse emitted by the station itself, which the team had set up to check the detector. Other events, aperiodic, were part of the irreducible background, including thermal noise due to molecular motion in the equipment. This set a natural limit to the detector’s performance but should be improved with better equipment. One thing the prototype station hasn’t seen is an energetic neutrino, and Klein doesn’t expect it to catch one. If the prototype survives the winter, the next step will be a group of five to seven such stations with equipment custom-designed to do the job. The full array is far in the future.